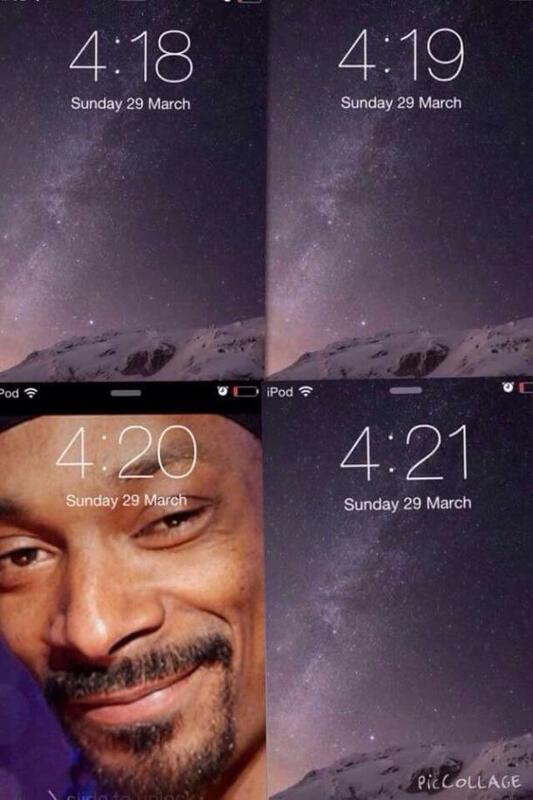 Because nothing goes better with cannabis than some dank memes. 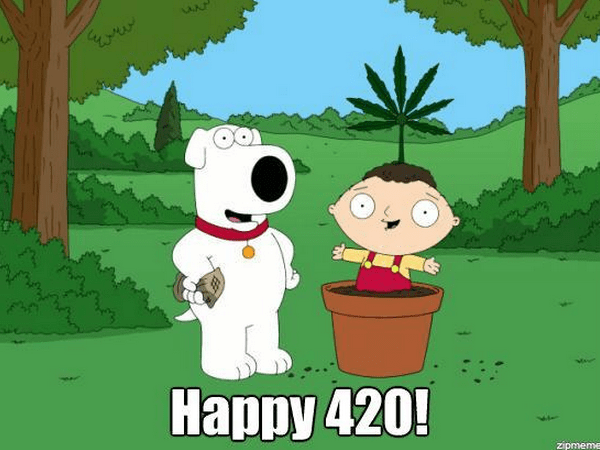 Please allow me to start by wishing a Happy 4/20 — sometimes written as 420 or 4:20, and always pronounced as four-twenty — to all who observe this glorious day! If you aren't yet familiar with the unofficial holiday for stoners and lovers of all things related to marijuana and cannabis culture ... you must be a total square. Because I am certainly as kind as I am cool, I will happily enlighten you in regard to the (likely very mellow) excitement surrounding us all today. 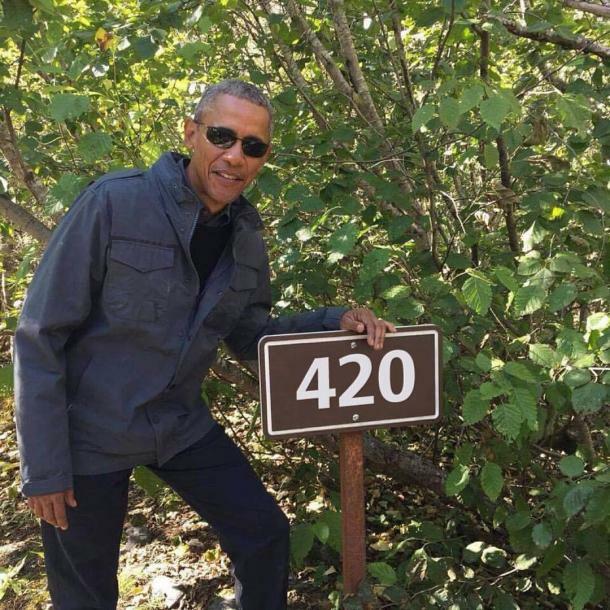 For years I myself had no idea what the origin of 420 truly was. Of course, that didn't stop me from chiming in with a cackle whenever the clock ticked over to 4:20 p.m. and someone would point it out while yelling, "Blaze it!" At one point I was told '420' comes from the police code related to the possession of marijuana, but then I heard someone else say it comes from adding up the numbers in the title of Bob Dylan's song "Rainy Day Women #12 & 35." And it wasn't until pretty darn recently that I learned the true origins of this day's name. It all started back in 1971 (shocker) at San Rafael High School in California (shocker part 2). There lived a group of friends — Steve Capper, Dave Reddix, Jeffrey Noel, Larry Schwartz, and Mark Gravich — who called themselves "the Waldos". This wasn't because they all wore red and white striped shirts with matching beanies, nor was it because they were starting a band or anything. Rather, these guys dubbed themselves the Waldos because they liked to spend their time hanging out by one particular wall outside of their high school. And if that isn't the most stoner thing you've ever heard, I don't know what else possibly could be. Every day after school at 4:20 pm, the Waldos would meet by the school's statue of Louis Pasteur and enjoy a big old illegal joint of marijuana. Of course, when you smoke a lot of pot, reminders of all kinds are super important. So when they passed each other in the halls at school each day, they would say to each other, "4:20 Louis" so that none of them would forget. Eventually, they dropped the "Louis" and started simply whispering "420!" Soon enough, the code name caught on with Grateful Dead followers also from San Rafael, and from there, counter-culture history was made. Now, every year on 4/20 you're bound to find those who enjoy pot smoking the day away in celebration of their favorite intoxicant. And because this is the age of the Internet, weed lovers have found another way to celebrate 420, as well — with memes! 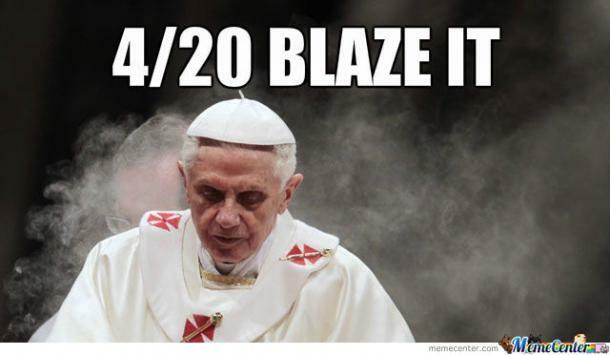 Now that you now the true meaning of 4/20, here 15 of the funniest 420 memes to help you celebrate what's known as unofficial weed day. 2. When 4/20 matters to you even though you've never even touched the green stuff. 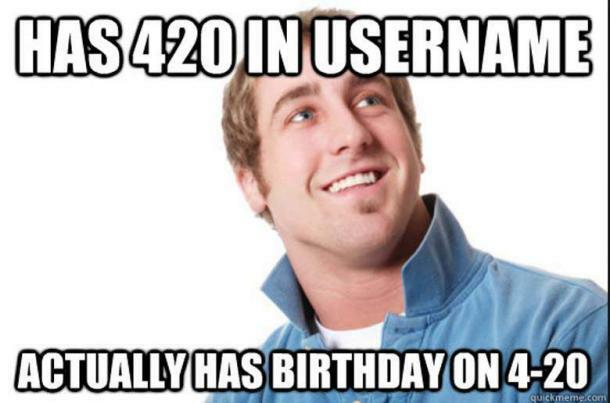 "Has 420 in username, actually has birthday on 4-20." 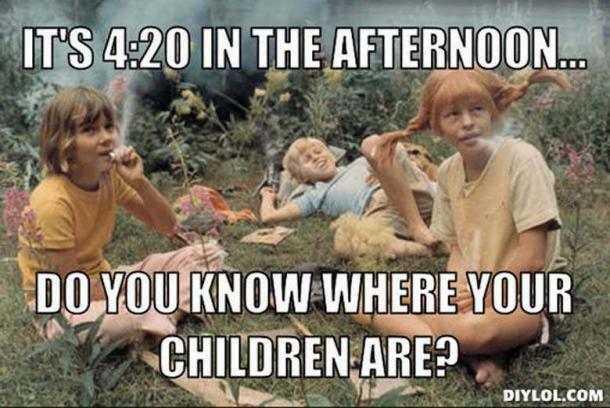 "It's 4:20 in the afternoon ... do you know where your children are?" 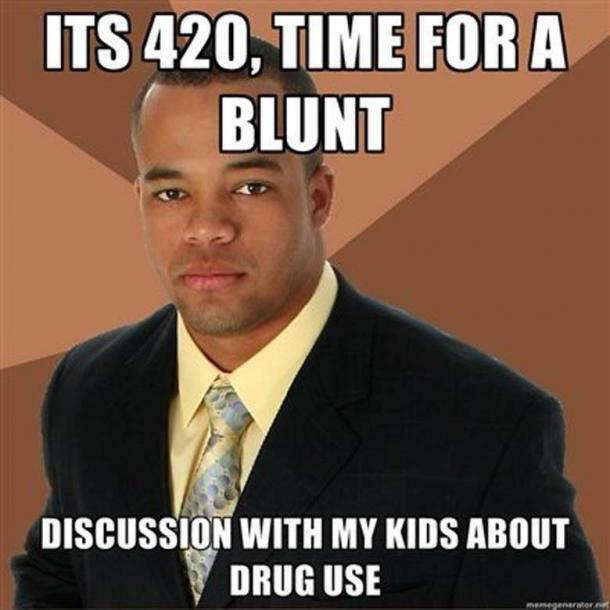 "It's 420, time for a blunt ... discussion with my kids about drug use." 5. Sure, we all know it's incense, but that doesn't make it less hilarious. 6. How can I make my phone do this every day? 8. This poor guy seriously should not have allowed pictures to be taken. 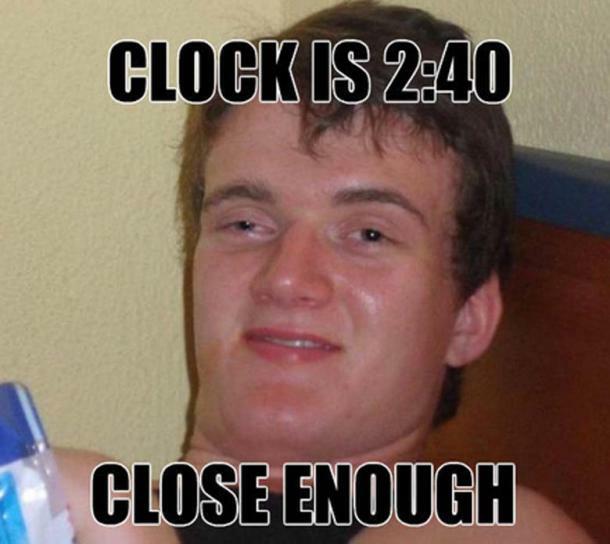 "Clock is 2:40. Close enough." 9. 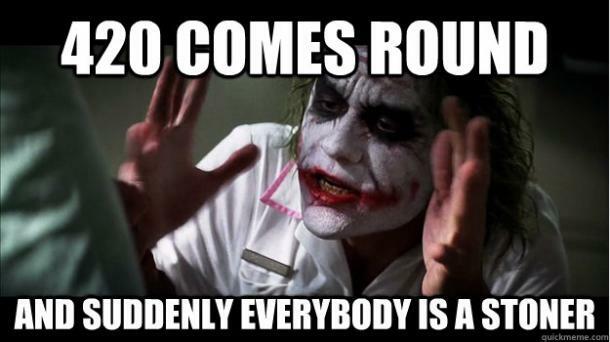 Even the joker is hip about it. "420 comes round and suddenly everybody is a stoner." 10. He'd better hope the Federation doesn't find out about this. 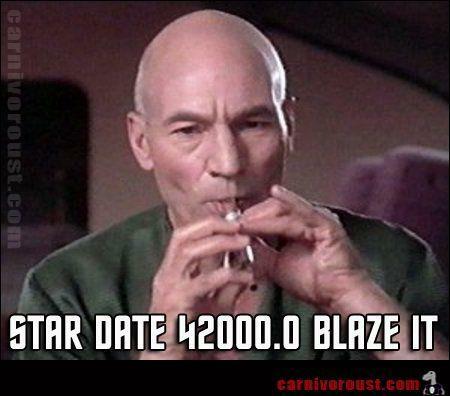 "Star date 42000.0 blaze it." 11. This is extra funny if you've actually read the Bible. 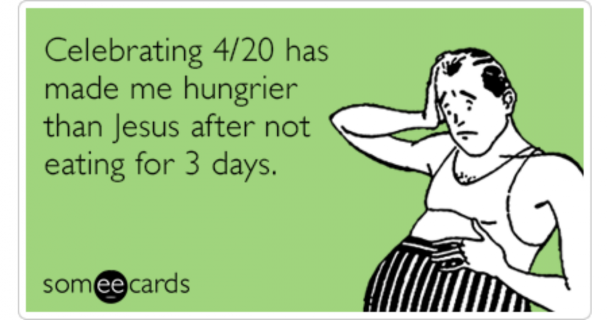 "Celebrating 4/20 has made me hungrier than Jesus after not eating for 3 days." 12. 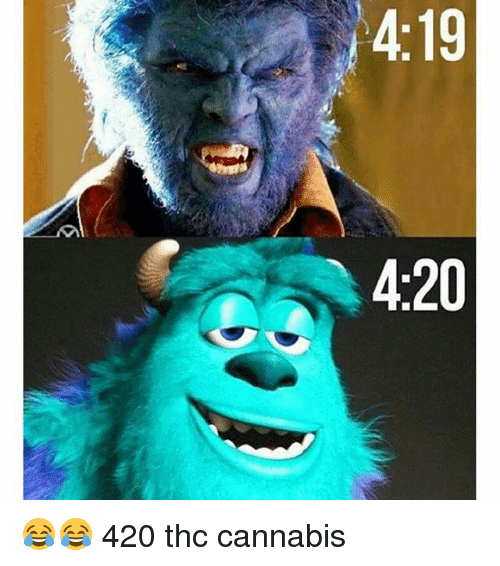 Think twice before taking 4/20 off! 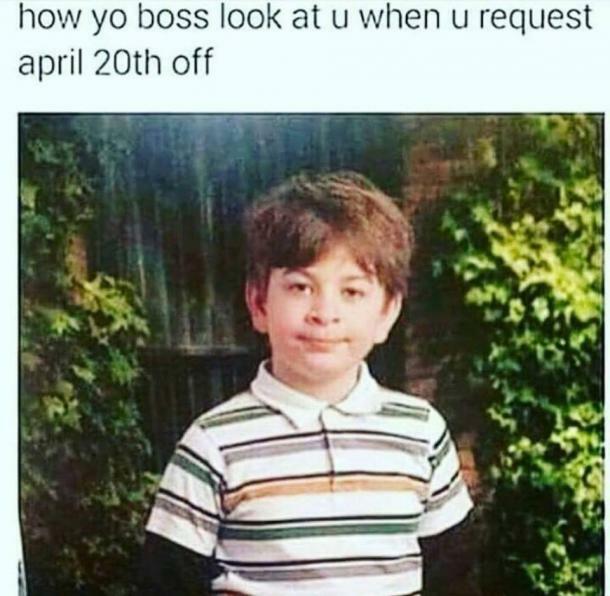 "How yo boss look at u when u request April 20th off." 13. 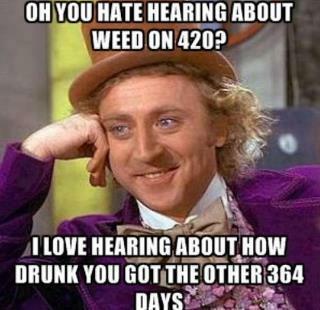 It isn't 420 without a Willy Wonka meme! "Oh you hate hearing about weed on 420? I love hearing about how drunk you get the other 364 days." "Brace yourselves. 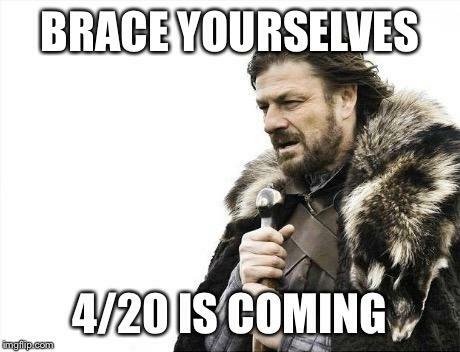 4/20 is coming." Rebecca Jane Stokes is a writer living in Brooklyn, New York with her cat, Batman. For more of her work, check out her Tumblr.